Part of a social media manager’s job is to filter through which platforms are or aren’t relevant to their industry — or, more importantly, their audience. But there’s more to choose from than Facebook, Twitter, LinkedIn, Snapchat, and Instagram. Believe it or not, Quora is one such platform you might want to add to your marketing portfolio. Quora entered the social marketplace about eight years ago, and it has since become a website worthy of a marketer’s attention. This question-and-answer platform allows users to ask, answer, and even edit the responses to questions related to virtually any topic or industry. Quora emulates a feature of Twitter and LinkedIn in that it has a follow feature. This follow feature allows users to connect with readers, colleagues, and other businesses so that they can associate with people who contribute to similar conversations. Users on Quora can ask or answer questions while following questions and people to create a stream of information aligned with their audience’s interests. When first signing up for Quora, you can start by following your connections from Facebook and Twitter. This allows you to connect and nurture your relationship with those you already know you’ll want to answer questions for. It also helps you understand what your core customers and readers are most interested in learning about. Quora shares features with other popular social applications, so what makes Quora unique? Two main elements: design and community. 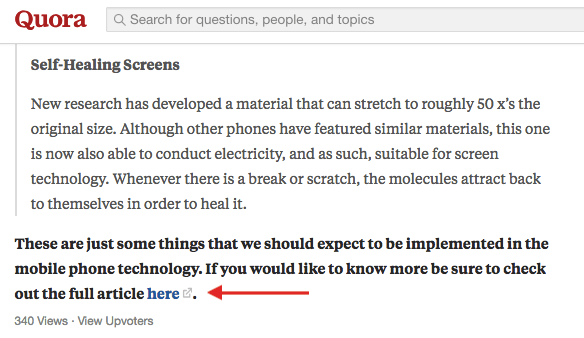 Quora’s forum-like design makes for a positive user experience in that it focuses its users entirely on specific questions and answers, rather than broad trending topics that brands can’t easily participate in. In other words, whereas social networks like Twitter and Facebook focus primarily on the user, Quora is designed to focus on the question. In doing so, all Quora users “play by the same rules,” so to speak. This ultimately helps business users carry over their subject-matter expertise and extend that expertise to more audiences. In addition to design, Quora’s community provides rich and relevant answers to the things people are searching for and talking about. This ensures that the focus of the website will always depend on and cater to the interests of each user and their followers. Opposite what you might think, this open-dialogue community doesn’t produce as much subjective or inaccurate information as you’d think. Each user’s answer competes with the answers other users post under the same question. The answer’s relevance therefore depends on how many views and upvotes it receives by the Quora community. This competition among answers encourages only the most knowledgeable users to participate. For this reason, many of them display their professional titles and business affiliations as an added sign of trust in their response. Quora also allows you to publish photo headshots, reinforcing its commitment to real, human answers — with a hint of networking potential for the employee answering the question. See how this looks in the Quora question below. The expertise of the people who are answering questions on Quora is truly impressive and only adds to the value of using the platform. You’d think because Quora answers can be posted for free by anyone, Google wouldn’t rank these answers all that highly. On the contrary, Quora answers do quite well in search engine rankings because Quora is designed to rank its best answers by how much its users trust them. In other words, Quora has done all the work for Google already — all you have to do is write an answer that users view and trust the most, and you can give your business some great exposure on Google’s search engine results pages (SERPs). Keep in mind that Quora answers are automatically given “nofollow” tags, which prevent search engines like Google from ranking website links inside your Quora answer any differently just because the Quora post itself might appear high up in a search result. For this reason, you should still invest plenty of time into your website’s on-page SEO — the search engine optimization given to your own webpages, as opposed to the tactics used elsewhere, like Quora. Quora Digest is an email newsletter sent by Quora to users who have viewed answers to specific questions on Quora’s website. Each email looks different to the recipient based on the topics Quora has found he or she to be most interested in. Quora Digest emails typically consist of 10 answers to questions the recipient would likely want to see. Recipients can receive these emails as often as multiple times per week or as infrequently as once a month. It all depends on how much time the user spends on Quora. Although the content of Quora Digest emails is generated automatically by Quora, marketers can still win a spot in these emails by answering questions that rank highly on Quora. The more questions you answer, the more authority you’ll build. This increases your answers’ rankings and, ultimately, puts you in a Quora Digest. The best part? These Quora emails go right to users who are interested in the topics you’re answering questions on. You get direct exposure to the people who fit your buyer persona without any of the heavy lifting involved in adding them to an email list. Many businesses use Quora not just to connect with potential customers and build authority on a subject, but to gain website traffic, too. When looking for questions to answer on Quora, consider if you already have webpages or blog posts that answer the question a user is asking. If so, take an excerpt from your blog post and use it to build your answer in Quora. When you’re done, link out to your blog or website content as an invitation for users to learn more about the subject. See what this looks like in the Quora question below. It’s unclear how effective this tactic is when done at length, so be careful how much you rely on Quora for blog or website traffic. Ultimately, you want most of your information to live in one place, that place should be your website. As you can see, there are several clear benefits to Quora. For one, it caters to specific subject matters. You can pick your own expertise areas and then stay there as your chief engagement. If your business or expertise is in foreign currency exchange, for example, you can write for a dedicated category of questions where you can relay your leadership and help answer questions for your followers. And yes, that very field has its own category of questions on Quora where people want to learn more about currency exchange. Check it out below. Then, as a marketer, you can consider the people who are asking questions or engaging in discussion with you as your potential leads. If you see someone is asking for help picking a good foreign exchange broker, or how to know if someone is a good adviser, don’t be afraid to mention your services and include the URL to your website when answering their question. You can also use Quora to do research on what you should blog about. Any good answer is going to be more than a paragraph, and could be used as the basis for your newest blog post. This is a great way to do keyword research and get a sense of what the keyword phrases and description that your potential leads really use, and see what they don’t understand or should know about your business. If someone is asking a fundamental question about your industry, think about writing a blog post to reply and then linking them in your answer to the blog post. You can bring them to your website, show them your calls-to-action, and present them with an offer all while answering their question. Have you started using Quora yet for your business?